I understand what causes condensation, and understand the need to insulate ductwork in non-conditioned space, but what does one do in this situation when the sweating ductwork is in conditioned space? Temp of ducts or metal must be below the dew point to sweat. So the humidity must be too high, so you'll have to figure out a way to lower it. this can easily happen a lot. Interesting, I will have to measure the humidity in the closet that houses the air handler/main ductwork though I suspect the rain from the ductwork will lead to an elevated reading. The house itself does not feel humid (thanks to the AC) and the closet with the HVAC is actually quite chilly (65 or so when house is at 70ish) which I thought would be better for preventing condensation. The closet is on an outside wall. It's in a room that has a supply vent (though its closed), the door to the closet is open. The room and the closet are the coldest places in the house I assume due to the ductwork being there and not being sealed very well, (which I understand is less than perfect but not THAT much of an issue in conditioned spaces?) I would say that the leaky ductwork is more than the equivalent of a supply vent in the closet based on the cold temperatures there. The duct sweats because its outside surface is below the dew point of the air surrounding it. Raise the temperature of the air surrounding it. Raise the temperature of the air inside it. Eliminate pockets of dead air around the duct. There is more but it gets very technical and has smaller effects. Perhaps the airflow through the coil & ducts is too low causing the metal to be too low a temperature below dew point. This sweating in the conditioned space could be an indication that the A/C is NOT effectively & sufficiently reducing the humidity & lowering the dew point! If possible do what is necessary to Increase the airflow to say 425 to 450-CFM per ton of cooling; also may need larger returns to achieve that airflow level, etc. Another good option is to use a dehumidifier. Yes, you could insulate the ducts; - usually the other options will solve the problem. If other options do not solve the problem insulate the ducts, or insulate them first, it is your choice. Bmurphey - I thought of insulating it but I can see sweat on ducts well into the interior wall/ceiling cavities that they run - area's I can not get to with insulation, though the problem is MUCH less there. I guess I could insulate all I can get to. Udarrell - I have had multiple companies come out to do "checkups" the system and everything is always good, though it seems they send very junior guys to do this work. The last inspection/checkup went horribly wrong, the tech left a capacitor off or a connection to a capacitor loose, which caused a fuse to blow and the compressor to try to cycle off and on until is overheated. They ended up replacing the compressor (interestingly enough it only took the two of them a total of a 1.5 hours to do that). There are hundreds of companies in the area and wile I have clearly not tried them all, I have not found one that seems to send anyone of any talent to the house. Kevin - see above, DIY is probably the best I can get, the trial and error of service companies is killing me. I would gladly pay someone to do the work and have tried with little to no success. I have sought advice of neighbors with the same house design and they said they just don't use the "swamp closet" or "rain closet". You can seal and insulate the ducts in your rain closet yourself if you're confident you have a knack for it. We just can't tell you how to do it! But that IS the answer. Air leaving a cooling coil is often around 55 degrees with relative humidity levels close to 90. It is only when this same air is introduced properly into a room and mixes with the air in the room does the air temperature of the introduced air go up and its relative humidity go down. Example: air coming into room at 55 degrees at 90% relative humidity, when warmed up to 75 degrees (without adding or removing moisture to this same sample of air) relative humidity drops to around 45%. In both cases, the dew point temperature was 52 degrees. Psychometrics 101. How does this relate to your rain closet? Well, not only is the metal duct surface cold, if it is leaking it is pumping air into a room that likely can't easily get rid of what is pumped in, so moisture builds in this room until it is damp enough to start sweating on the metal duct. The main caution pertaining to sealing and insulating ducts is to be sure the seal is very good, and the insulation has a vapor barrier on the outside, and that ALL seams in the insulation are taped over so no moisture can get in and begin condensing all over again on the metal surface. Just wanted to follow up on the progress (well, no real progress... yet). I measured the temperature and humidity throughout the house, most rooms were within a degree or two of the thermostat (70) and most rooms measured 45-55% humidity with the highest levels being the minutes before the AC cycled on. The closet with the air handler is a different story indeed, the temperatures there are 62-66 and the humidity has read as high as 85% though I suspect the large amount of water from the sweating is causing the rise in humidity. In any event, I have purchased a portable dehumidifier to try to help with the high humidity in the closet. I also found many large gaps in the ductwork at or near the air handler. This probably contributes to the much lower temperatures in the closet. Once dry, I am going to try and at least cover some of the obvious gaps with foil tape (straight seams) or mastic (curved junction points). Also forgot to add that I measured the return air temperature at air handler and supply temperature just coming out of air handler and the drop is always 21 - 23 degrees with the lowest supply temp reading of 44. You really should insulate those ducts. If you've got a forced air heating or air conditioning system, duct sealing and insulation is something that you need to know about if you want to be energy savvy. Most homes with unsealed/insulated ducts lose between 10% - 30% of the energy used for heating and cooling because the nice warm (or cold) air in their air ducts leaks out before it reaches the living space. In other words, almost a third of what you're paying to heat or cool your home is wasted before it ever gets to you. Most air leaks in ducts happen at joints and seams in the ductwork, not on the smooth, straight parts of the ducts. An easy do-it-yourself test to look for obvious air leaks in your ducts is to hold up a candle (or even better, a stick of incense if you can find it) to the junctions and seams of your ducts. If you see the flame (or smoke) getting pulled in or pushed away from the duct, there's some air leakage going on in that spot. Some of the worst problems with duct leakage occur when the furnace and ductwork is in a basement that doesn't have wall insulation and is very cold. That's because when the duct (with very hot air inside it) is surrounded by very cold air in a cold basement, there's a big opportunity to lose heat. For air conditioning systems, some of the worst problems occur when your air conditioner is outside of your home, on your roof or in your attic. The exposed ducts there can have the same problem as heating ducts in a cold basement. The good news is that fixing this problem isn't usually too expensive, and the impact is usually so big that the project often pays for itself with a year or two. If you're going the do-it-yourself route, you can make a difference by getting mastic tape and taping all the seams and junctions of your ducts (including where it connects to your furnace or air conditioner). Don't forget the return ducts as well — many times, return ducts are built into walls and if they are pulling air from outside the home, your furnace/air conditioner's effectiveness will suffer as well. You've got to be careful to seal every junction and seam where there's leakage — otherwise, the air will just leak out even faster from spots you missed. Add duct insulation, made of foil or vinyl, after the duct sealing is complete. 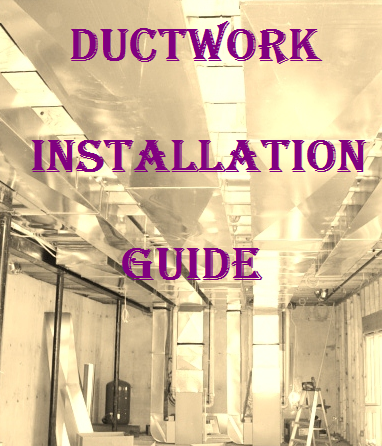 Duct Seal and Ductwork Insulation: these two very important chapters from my Energy Saving Edition book can save you hundreds of dollars not only on the saved energy cost, but also on the labor cost if you are going to do it as a DIY project! In order to gain access to the pages please pay an access fee of $3.50. Just click on one of the “Buy Now” button below. Once you pay, you will gain an instant access to the page!